When you have a family with vastly different interests, it can be a little challenging to find things to do that everyone enjoys. Universal Orlando is one of the places that works for my whole family. There are thrill rides and rides for the less adventurous. There are shows and characters and fun areas to visit, so we never run out of things to do. Even though I love to visit Universal Studios with my children, I also like to visit without the kids. My husband and I have escaped for a weekend of fun at Universal and recently I was able to attend a press trip with several other bloggers while we faced our fears at Universal! Since I love rides, I can’t say I was actually facing any fears by going on them, but I faced many fears in the haunted houses! The roller coasters like The Hulk shown above were a lot of fun and a great way to let loose after all of that scariness in the haunted houses! For me, the parks are the place to just have a great time. 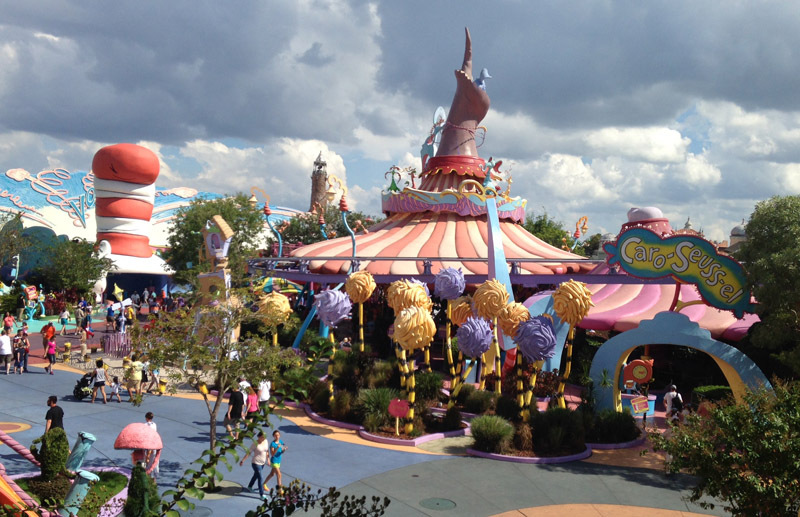 Seuss Landing is a favourite spot for my kids. 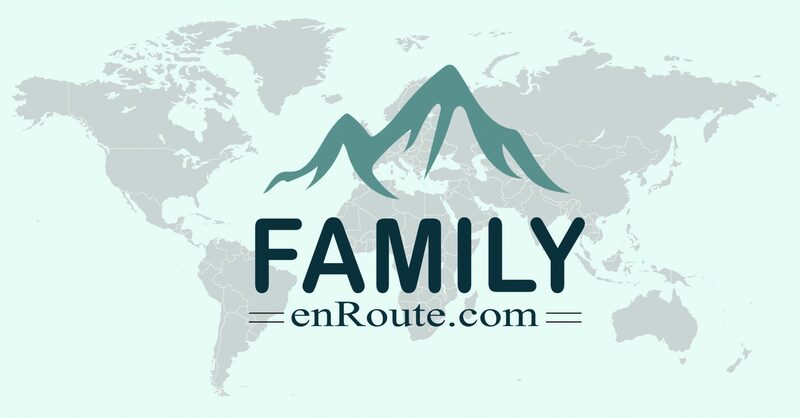 It’s perfect for my son who prefers rides that are a little more relaxed and they can all relate to the rides and the characters since we read the stories as a family. The High in the Sky Seuss Trolley Train Ride is one we never miss because the queue line is as much fun as the ride! 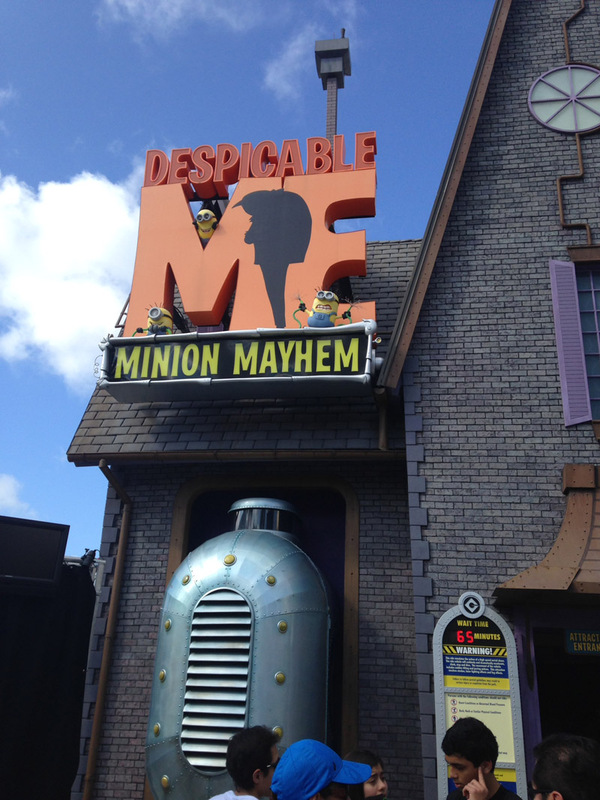 Another family favourite that we never skip is Despicable Me Minion Mayhem. Who could pass up the chance to become a minion? I know I can’t! At the exit you can meet a minion and join in a dance party! The highlight for me has always been the Wizarding World of Harry Potter in the Islands of Adventure park. It is the home to my favourite ride of all time, Harry Potter and the Forbidden Journey, which is found inside of Hogwart’s Castle. You can tour the castle without going on the ride too, if that is your preference. As a family we also take advantage of Child Swap when we go on this ride, so that my husband, daughter and I can ride even though my youngest is not tall enough and my other son finds it a little scary. We also pick up our own wizard wands in Hogsmeade and get a cup of Butterbeer when we’re there. I’ve been anxiously awaiting my chance to visit the new section of the Wizarding World of Harry Potter that is located in Universal Studios Florida. This is Diagon Alley, and it was worth the wait! The first thing I noticed when we stepped into Diagon Alley was the dragon on top of Gringott’s Bank. It is a huge fire breathing dragon that you can not miss. 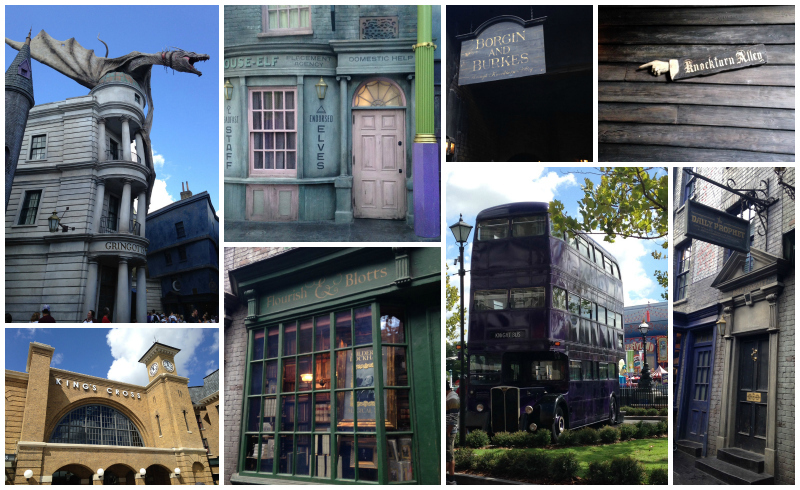 There were so many fantastic things to see, like the Knight Bus and Knockturn Alley. You can exchange your money at Gringott’s Money Exchange, and grab some Butterbeer Ice Cream at Florean Fortescue’s Ice Cream Parlour. One of the greatest things about the new park is the Hogwart’s Express. You can ride the train between the two parks and have a unique Harry Potter experience on your ride. 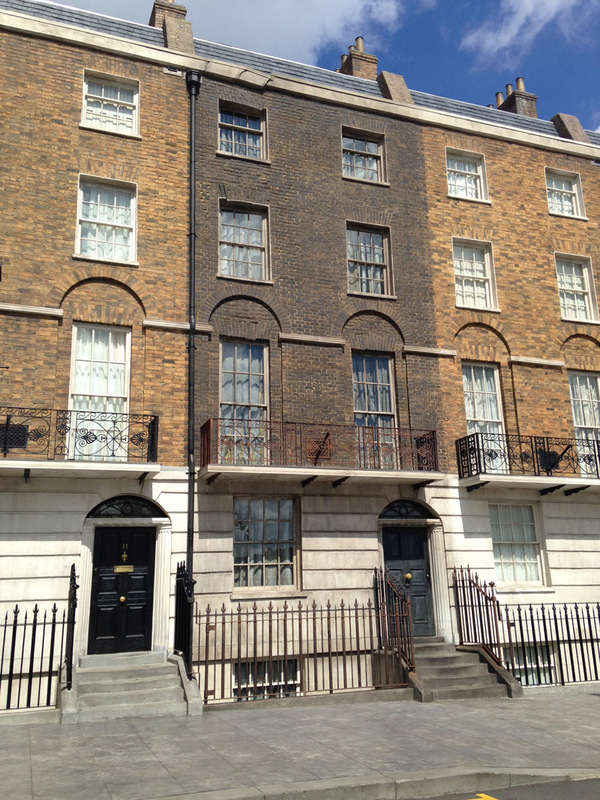 There is so much to see in the new Diagon Alley that I need to go back and explore again. It’s great to have an excuse to visit again! What would you most like to see at Universal Orlando? I think universal Orlando is a must stop if you have older kids. We took my 3 year old there because we wanted to check it out and he clearly didn’t enjoy it as much as we did. I can’t wait to take him back there when he’s older. I think this would be a great trip for just me and the husband. Our children are older now so it is fun to just do things just for us. I would love to visit Diagon Alley as well. Oh my oldest and I would be in heaven at the Wizarding World of Harry Potter so cool! I’d love to take my grandkids here one day! Thanks for all of the info! I would love to check out the Minion ride! This would be awesome. However, I’m not a huge fan of long lines so this will take some planning! What a wonderful post ,love the photos.My grandkids would love to check out the Minion ride! Looks like a fun place to visit with lots of different activities to enjoy! So fun! Wish I could visit! We really enjoyed the movie Despicable Me .Sure sounds like a wonderful place to visit.